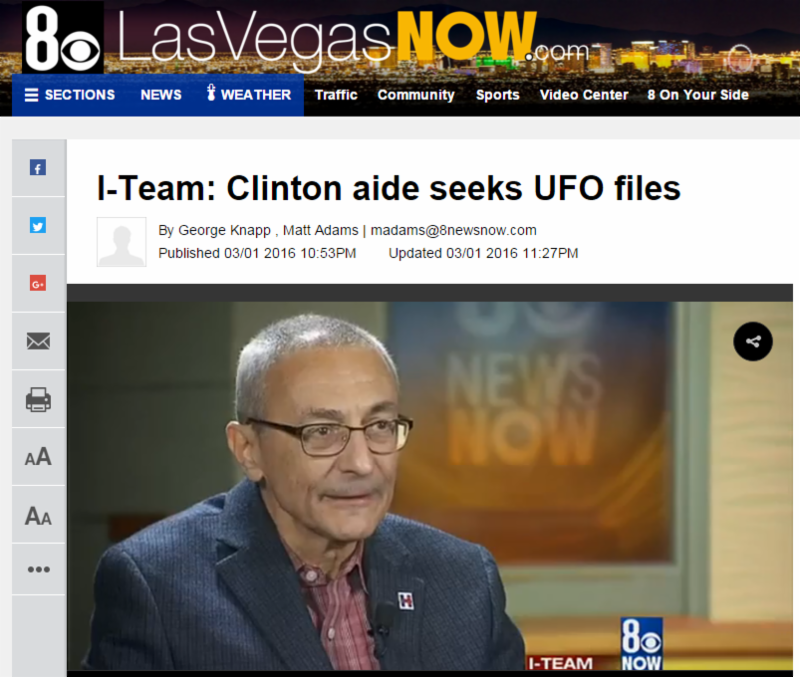 Via the good journalism of KLAS-TV (Las Vegas), Steve Sebelius and George Knapp, John Podesta has sent up another trial balloon regarding the willingness of Secretary Clinton's campaign to engage the UFO/ET issue if the media would JUST ASK THEM. This interview took place on March 1, 2016, and like Secretary Clinton's remarks to Daymond Steer of the Conway Daily Sun on December 30, 2015, it took place on a campaign stop in a primary state just prior to an election. Perhaps now the network journalists moderating the campaign debates and town halls will finally ask Secretary Clinton about the Rockefeller lnitiative. There is still time for the American people to hear the truth on this matter BEFORE they cast their ballots in November. There is still time for Disclosure under President Obama. 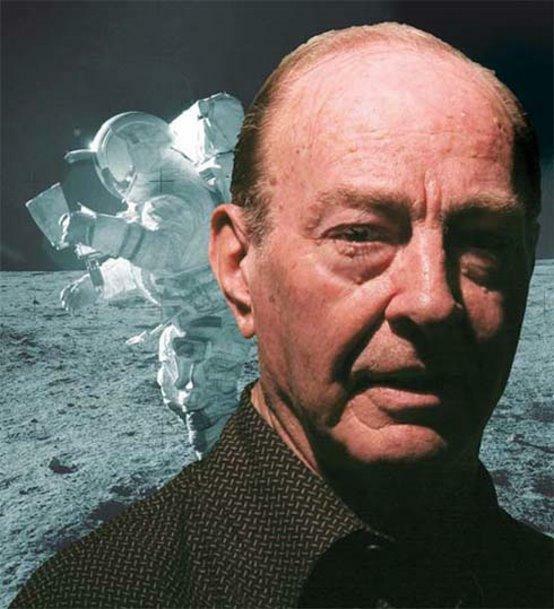 Apollo 14 astronaut, Dr. Edgar Mitchell, first spoke out on the ET issue in 1997. In this regard he was following in the footsteps of Mercury astronaut Gordon Cooper. Dr. Mitchell had been deeply affected by meetings he had taken at the Pentagon. Significantly he had grown up a few miles from Roswell, NM, and was there - a boy of sixteen - when the historic events of July 1947 took place. Many years later his stature as the sixth man to walk on the Moon coupled with his childhood near Roswell prompted many witnesses to the July 1947 events to approach him with their accounts. Some of these witnesses had never spoken to researchers - only to Edgar. This plus the work of many researchers convinced Edgar the Roswell incident was indeed the crash of an extraterrestrial vehicle with bodies recovered, and he said so - publicly. As is often the case, Dr. Mitchell paid a price for speaking truth to power. Over the next 20 years NASA and the Navy never commented on Edgar's statements with the minor exception in 2008 when NASA stated, "NASA does not track UFOs. NASA is not involved in any sort of cover-up about alien life on this planet or anywhere in the universe. Dr. Mitchell is a great American, but we do not share his opinions on this issue." But NASA was irritated by this truth teller. So, in 2011 NASA sued this American hero to prevent him from auctioning off a camera he had brought back from the Moon. They slapped this man in the face during the months following the death of his son, Adam. He donated the camera to the Air and Space Museum. On September 20, 2012, Congress enacted H.R. 4158, confirming full ownership rights of artifacts to astronauts on Apollo (and Mercury and Gemini) space missions. One day NASA will answer for this disgrace and for many others. Dr. Mitchell founded the Institute of Noetic Sciences because he had a great personal interest in the concept of consciousness. His most cherished project was Quantrek. He dreamed of raising very substantial funding so that leading quantum scientists around the world could research the origin of consciousness and other issues such as zero-point energy. That funding never came - an outcome very likely resulting from Edgar's truth advocacy efforts on the ET issue. In private discussions Dr. Mitchell told PRG he very much wanted the truth embargo to end. He spoke at two of PRG's X-Conferences and at the Citizen Hearing on Disclosure. He said, "Steve, let's break this thing open." Dr. Edgar Mitchell, like many others, did not live to witness Disclosure. There me be some in the Pentagon and the CIA and elsewhere who think their truth embargo will outlive everyone who can challenge it - the witnesses and researchers.